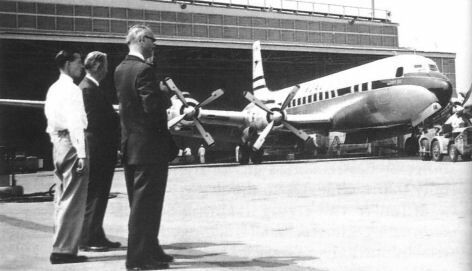 The DC-7 prototype heads a line-up at Long Beach showing the postwar Douglas airliner 'portfolio'. 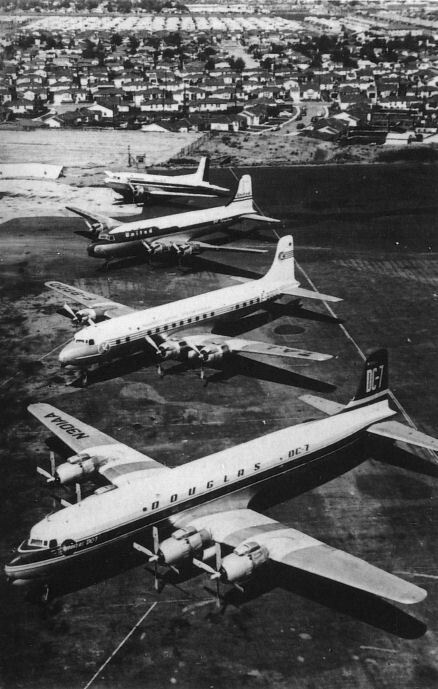 From the rear: DC-3S 'Super Dakota'; DC-4 Skymaster; DC-6B F-BGOD; DC-7 N301AA. N301AA, the DC-7 prototype which was delivered to American Airlines in April 1954. It was withdrawn in 1959. N70C, the prototype DC-7, first flew on December 20, 1955. It joined the fleet of Panair do Brazil in June 1957 but crashed on approach to Recife in November 1961. 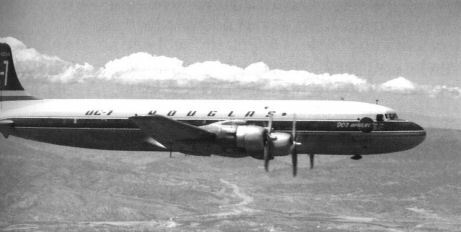 The first flight of the prototype Douglas DC-7C Seven Seas (N70C) took place at Santa Monica on 20th December 1955 and lasted 2 hours 45 minutes with chief test pilot Bert Foulds at the controls. The Seven Seas is designed for non-stop flights of up to 5,000 miles with 58 passengers. The wing span has been increased by 10 ft. to 127 ft. 6 in. and the a.u.w. by 14,000 lb. to 138,000 lb. Seven Seas is on order to B.O.A.C., K.L.M., Sabena, S.A.S., Swissair, P.A.A., Braniff and Northwest; also Alitalia, T.A.1. (France) and C.M.A. (Mexico). Rolling-out BOAC's first 'Seven Seas', G-AOIA. G-AOID taxying at Heathrow in 1960. Like most of the BOAC fleet, it was acquired by Saturn Airways upon disposal. G-AOIB during a 'slip' for refuelling at Prestwick in 1960. Superb portrait of G-AOIA, BOAC's first DC-7C. It is preserved in Colombia. With windows and hatches sealed, G-AOIC laid up at Heathrow awaiting delivery to Saturn Airways. In April 1964 G-AOIE was sold to Caledonian Airways, being operated up to May 1967. Its cockpit is preserved in Ireland. 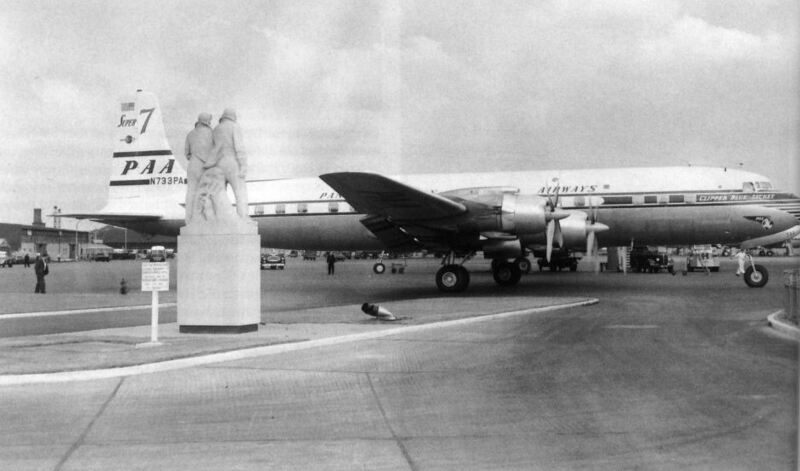 'Clipper Blue Jacket' DC-7C N733PA was delivered to PanAm in April 1956 and is illustrated alongside the Alcock and Brown statue at Heathrow. PanAm declined to call its fleet 'Seven Seas' preferring 'Super 7s'. 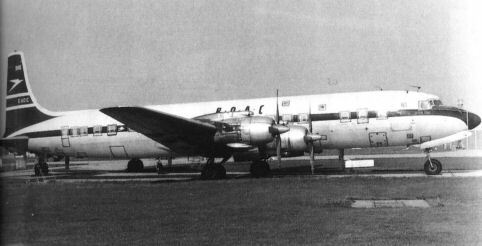 Two of the BOAC DC-7Cs (G-AOII and G-AOIJ - illustrated) were converted to DC-7CF configuration in 1960. 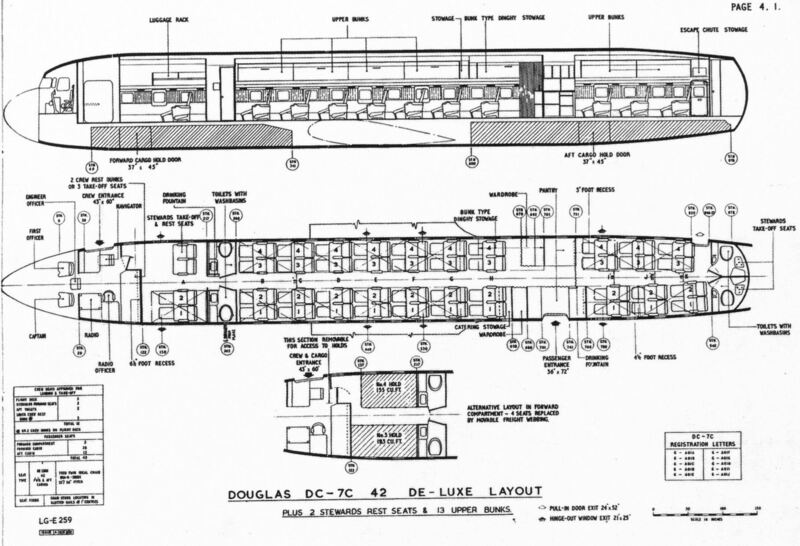 BOAC cabin layout diagram showing the De Luxe 42 passenger layout and the positions for the 13 bunks.